Saturday night the hubbie and I tried to sneak off to a little movie date- we went to see The Three Stooges. :( We were so disappointed! I'm sorry if I'm breaking anyone's heart here...but seriously friends, it was no bueno. My husband is a huge Three Stooges fan- he grew up on old re-runs of the show and as an adult still laughs and enjoys every episode he watches. So, needless to say when we found out there would be a movie- we were going to see it. Good news: maybe by me giving it such bad reviews you'll go in with low expectations and actually enjoy it! Let's hope!! Sunday we missed church because we had an early dinner date at our friends' house. Indian food was the theme (hence my dessert ingredient choices) and let ME JUST SAY- IT WAS FANTASTIC!!! We showed up with a pot of my coconut curry sauce and dessert- they supplied rice, lentils, tandoori chicken, and eggplant! Holy moly was it good. Oh, and yes...lots and lots of naan. "MmMmmm Naaaaaaaaan" <-- said in Homer Simpson voice. I have never been so full in my whole life. ...Well maybe I have...but not in a while. I was STUFFED. Good times indeed! Then yesterday (haha) I was a big ball of sick. No, not from the food. I'm 100% sure. I won't go into details but let me just say...I was a walking zombie. My poor husband. Today- I'm feeling a lot better! Yay!!! Like, A LOT better. It's amazing what 24 hours will do. Good thing too. There's lots of edible decorations I need to get started on. More specifically, edible paint palettes, bows and Sanrio inspired decs! Oh! Which reminds me- those cuties shown above? They were just mailed out a few days ago and I couldn't help but put a picture up. They were cute!!!! Shipped out together, destination California- a little girl's birthday cupcakes for her classmates at school. FUN!!! These guys below? JUST finished for another mama and her sweet little one's upcoming big day! We were requested to make Hello Kitty's bow purple because it was the birthday girl's favorite color ;) You got it! I title this, "The Evolution of a Tiny Treat", haha. So that's it for us! That's our weekend recap. A good one I'd say, even despite the day of sickness. Sounds like a great weekend despite the sickness and the Three Stooges. Which BTW, I had no desire to see, and so now I know for sure I won't see it! Bummed to hear the 3 Stooges was not good. They should just remix the old ones and show them on TV more! 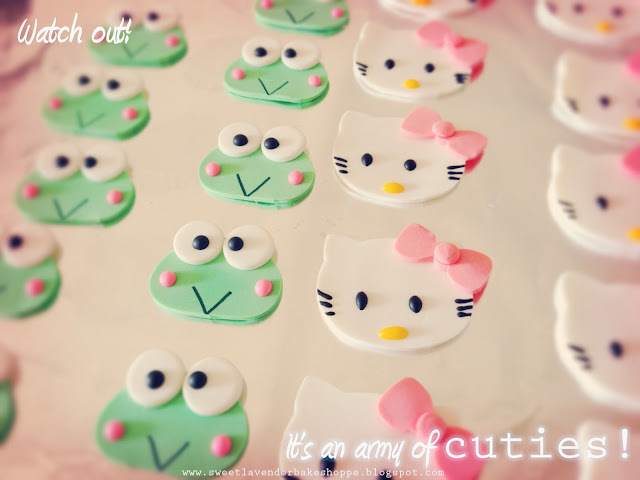 I love your little Sanrio cuties!! I absolutely love these little toppers and getting to hear about your weekend! Bummer on the movie and the sick thing! Haha, why thank you!!! Glad to be a source of entertainment! :) Can't WAIT TO SEE your pictures!!!! !